UK Games Expo sprawled across the last weekend. 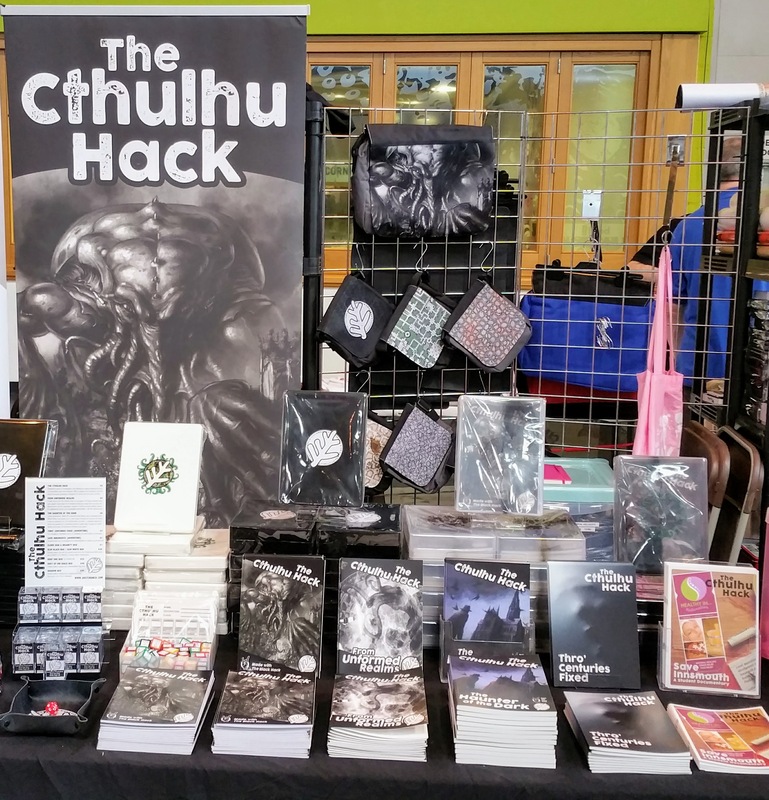 I have spent much of that time standing up, behind the Just Crunch Games stall, regaling people with the virtues of The Cthulhu Hack. As if getting up at 6.30am to hit NEC Hall 1’s floor for 8.30am wasn’t enough, I also signed up to GM games in the 8pm slot (a scant two hours after the trading hall closedown at 6pm). I ran two sessions of “Operation Header” from Cubicle 7’s ‘Covert Actions‘, a scenario supplement for the Kickstarter funded ‘World War Cthulhu: Cold War‘. As it was only released to backers as a PDF last week, I figured (A) no one was likely to have read it and (B) I could show how easy it was to convert any Cthulhu game’s scenarios to TCH on the fly. While I considered running a different adventure on the Saturday, I enjoyed the Friday game and it seemed silly to not give it another run out. To be clear from the outset, the version of the adventure I ran stripped out a lot of the finer details from the adventure purely out of necessity. I had 4-hours (at most) to introduce the game, run a quick round of character generation, explain the mechanics, set the scene and get running. On both occasions, the preliminaries ran to no more than 20 – 25 minutes. Also on both occasions, the game ran through until almost midnight (after which I had to clear up and walk the trail back from the Hilton Metropole to my own hotel). Running the game wasn’t the challenge on the Saturday; it was being heard over the hubbub of five other games running at the same time in a confined space! 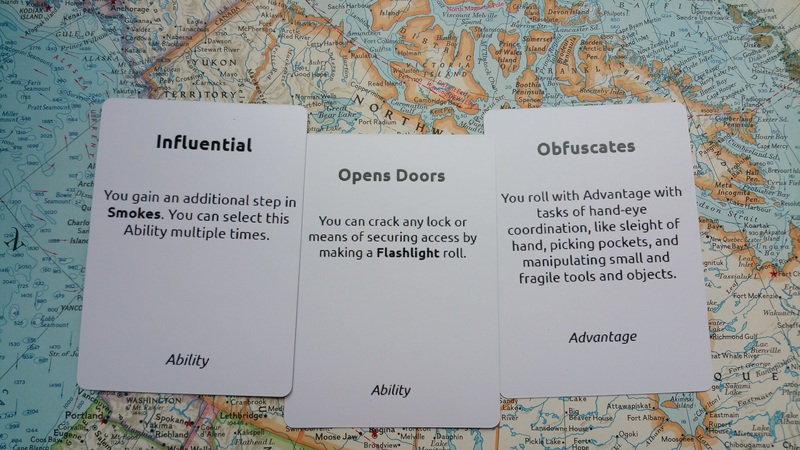 I used the Classless Cthulhu generation process for Saves and Resources, but used a pre-generated selection of Abilities and Advantages (see the picture below). This worked really well, although I didn’t get the explanation of the Resource selection perfect until the second night. Basically, I followed the standard process for Saves, but allowed the players to list six scores and assign them; then each player could assign 14 dice to the Resources (Flashlights, Smokes, Sanity, Hit Dice, Armed, Unarmed). I have used the 14 dice idea before – but these two outing at Expo suggest to me that fourteen weighs in as “generous”. I think, if you want to provide a brutal game you can drop the number of dice to 12 or 13. That means that a group of players have to rely upon each other much more and cannot simply stand alone against the horror. You can read about Classless Cthulhu in an early article on this blog, and it will appear in the upcoming version of the core rules (as yet hanging somewhere between a v1.5 and a full on v2). My prep for the adventure involved reading through the whole adventure once and then going back to map notes. My notes consisted of an A6 sheet with a map of the main site of the adventure and character sketches – the briefest of thumbnails in keywords – scattered around it. I wrote a room or location, then added the thumbnail biographies within. On the map, I added a coloured dot to connect the two. I used a third colour (red, for good reason) to pick out the location of the threats in the adventure – whether living threats or potential hindrances from traps or security. I prepared the pre-gens using cards and some typed notes on the personality and background of each individual (not shown on the image). I also printed out some suitable passport pictures of people from the mid-1970s, which for some seemed to provide an essential grounding point for character, atmosphere and tone. Admittedly, much of the tone came down to the fantastic 70s hairstyles and one character’s impressive moustache. Most of the first hour of the game revolved around the briefing and travel to the adventure site. The next hour dealt with investigation of the keyed location. The final hour, the descent into madness and death. Well, for some at least. A coda at the end outlined the fate of those who survived. In the session on Friday, one player noted – mid-coda – that the revelations must surely mean a Sanity role for his character. Reduced to just a 1d4 in his Sanity resource, he thankfully rolled a 1. To have rolled anything else would have been to spoil the moment, so I’m thankful to the Fates of the Die for watching over my games. The Friday session ended with three dead, one permanently insane, and the final character alive, but sorely reduced in all aspects. The Saturday session ended with three dead and two survivors, both likely to never serve on active duties ever again — or even to fit well into ordinary open society. I experimented in both sessions by making the Hit Die a resource rather than a simple method for calculating hit points. Struck by an enemy, the player rolled the Hit Die and a 1 or 2 indicated a decline in health. I don’t feel that the outcome worked, but want to give it more thought. It just seemed to make the characters too resilient — or maybe the players just rolled too well. It does mean that the characters can handle scuffles and physical confrontation without dying early in the adventure – while they have the opportunity to fail through the dwindling of their Sanity and Investigation resouces. I won’t make a judgement on these two sessions alone. I might be tempted, as with rolling temporary insanities on a failed Sanity roll, to create a temporary injury table. Rolled a 1 or 2 on the Hit Die means not just a drop but a genuine temporary disability. If the horror snaps your arm when you roll a 1 or 2, you won’t push on and keep fighting — you’ll reassess your poor life decisions and try to find another way. The players all appeared to enjoy their sessions and many commented favourably on the lightweight system. One noted that he’d only played one Mythos-themed game before, with Call of Cthulhu 6th edition, and had struggled with the sheer weight of numbered presented on a single character sheet. The Cthulhu Hack obviously sways wildly in the opposite direction – and that made it an easy in for newcomers and those put off by mechanical complexity. On top of good feedback, several players also came around the next day to pick up copies for themselves. The white Slim Box version with the new green tentacle halo around the Elder Sign sold particularly well – with only two copies left at the close of the weekend. I’m really happy with the outcome of the whole weekend — and I hope that those who picked up a copy of the game have the chance to play and enjoy it themselves. But, if you didn’t pick up a copy, remember that DriveThruRPG and RPGNow’s OSR Extravaganza has the core Cthulhu Hack books available for 15% off (or more) until June 11th. Pick up The Cthulhu Hack, From Unformed Realms, The Haunter of the Dark, Save Innsmouth and Thro’ Centuries Fixed from the Just Crunch Games page for at least 15% off.